Rømmegrøt, kanelbulle, mondlukaka, filmjölk, gravadlax - to most people in the world those words mean nothing but to the people of the Nordic, they invoke memories of Christmas dinners, summer picnics, and the homemade treats of grandma's kitchen. There was a time when Nordic cuisine was practically unheard of outside of the Nordic region. A few immigrant communities in the United States and Canada kept the Old World traditions alive on this side of the pond but overall, Nordic food was a hyperlocal cuisine that stayed close to home. Today, it is a different world and the flavors of the Nordic landscape have become the new hot foodie trend. Before "New Nordic" took over the food world though, traditional Nordic cuisine was born out of the environment and the ingenuity of the people who had settled the far Northern reaches of Europe generations ago. Through the will to survive and thrive, they developed a vast number of unique cooking and preservation techniques, cultivated what they could out of the harsh frozen soils and seas, and brought family and friends together over shared food traditions and harvest celebrations. So who are these Nordic people? Rather than being defined by the borders of a particular country, the Nordic represents a vast territory of Northern Europe, whose people share similar languages and heritage. At its core, the Nordic is comprised of the modern day countries of Norway, Sweden, and Denmark, collectively called Scandinavia. Over the centuries, these three kingdoms fought over and traded land so often that today the people of the region are more similar than different from each other and share many historic connections. More broadly, the term Nordic is used to cover both Scandinavia and modern-day Finland, Åland, the Faroe Islands, Iceland, and even sometimes Greenland. This more widely drawn border of what the Nordic region encompasses is tied to the fact that all the countries included share similar historic connections and of course similarly harsh Northern climates. The recipes and traditions of each of the Nordic countries vary but overall, they share what has come to be known as Nordic cuisine. Similar recipes, often time the same ingredients, and uniquely Nordic culinary techniques all link the various individual countries. These old connections and linked traditions have become a global trend, thanks in large part to New Nordic cooking, which combines traditional Nordic recipes and culinary techniques with modern gastronomy trends. This modern style of cooking Nordic cuisine has taken off, especially since Copenhagen's famous restaurant Noma topped the world's best restaurant list four times over the last few years. Traditional Nordic cuisine is not to be overlooked though. It is the traditional Nordic recipes, ingredients, and styles of cooking that have given New Nordic the flavors to succeed on a global scale. These flavors and recipes were largely born out of environment necessity. Climate is, of course, a dominant force in the Nordic, due to its location in the far north. Long harsh winters and short summers mean that the people of the Nordic, especial in the past, have had to put a lot more thought and effort into what they grew and how they preserved their foods. Short summers mean a shorter growing season. Many fruits and vegetables simply won't ripen fully in such an environment. Nordic cuisine is therefore dominated by mainly indigenous ingredients that have perfectly evolved to the climate and plants specifically bred to survive the northern latitude. Root vegetables, in particular, are important thanks to their hardiness and their ability to survive under the soil, even after an early frost at the end of the short summers. During the long winter months in the Nordic, food is incredible scarce and before the modern age of supermarkets, it was absolutely vital to plan ahead and store food for the long winter. The result is that Nordic cuisine has a seemingly endless number of ways to preserve fruits, vegetables, and meats. You will find pickled vegetables, salted meats, dried fish, and fruit jellies. Older homes all seem to have a root cellar to keep the winter food stores preserved and even today, many of the popular dishes include some type of preserved food. Besides preserving the bounties of the summer, Nordic cuisine is also heavily dominated by year-round products such as meat, seafood, and dairy items. Surrounded by the deep, cold waters of the Baltic Sea and the Atlantic Ocean, seafood in this region of the world is known as some of the best on earth. 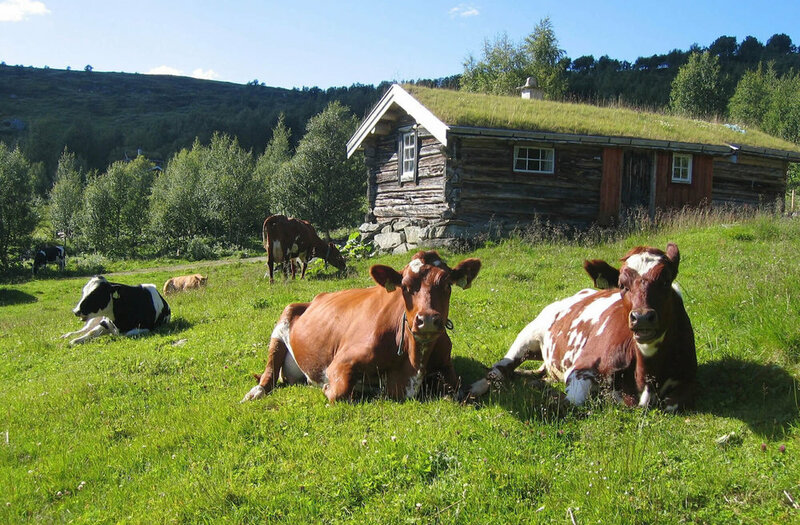 Raising animals, such as cows, sheep, and even reindeer provided the people of the Nordic with meat which was easily cured, salted, and preserved for winter and of course dairy which would often be preserved long term in the form of cheeses, creams, and butters. Although much of Nordic cuisine seems dominated by these preserved foods and animal products, the short summers of the region see a different kind of cuisine celebrated - that of the farms and the forests. Due probably to the fact that they must endure dark, cold winters, the people of the Nordic seem to have a closer connection with nature and warm summer days are celebrated with an almost religious zealous. Summertime recipes in the Nordic feature fresh picked berries, foraged wild mushrooms, and lots of fresh vegetables. Whether it is being praised for its health qualities, showcased at the world's top restaurants, or just celebrated among friends and family, Nordic cuisine has managed to evolve out of some of the harshest landscapes known to humankind. Despite all the recent praise though, at its core, traditional Nordic cuisine is quite humble. As the Swedish say, their traditional dishes are husmanskost - the food of the simple homemaker, just quality ingredients, no fuss, and basic flavors. Food in this region of the world is not about grand luxuries, and yet it wins top culinary awards. It is not about strong spices or complex flavors, and yet some of the regional techniques for preservation are quite ingenious. Nordic cuisine is quiet and yet boldly stands its ground. In a world rushing towards a bland mono-food culture, Nordic cuisine is not yet ready to be pushed aside. From the grand kitchen’s of some of the world’s top restaurants to the simple homemade treats of a Nordic grandmother’s kitchen, this is a cuisine that still has something to teach the world.